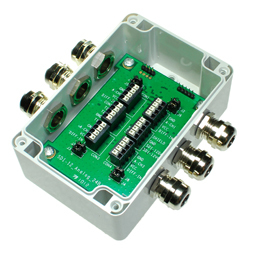 The TBSAB02 is a 4+1 channel analogue to SDI-12 interface for 24 Bit A/D conversion of sensor signals. A/D conversion and configuration is controlled via SDI-12 commands. The interface is equipped with signal conditioning circuits which can be customized for various input voltage ranges. 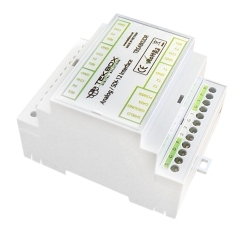 It offers low current consumption and comes in a Fibox PC081206 IP67 rated or in Din Rail housing. Each channel can be independently scaled with a 3rd order polynomial to enable gain and offset calibration of the connected sensors. A built in 3 wire interface for direct connection of PT100/PT1000 offers additional versatility. 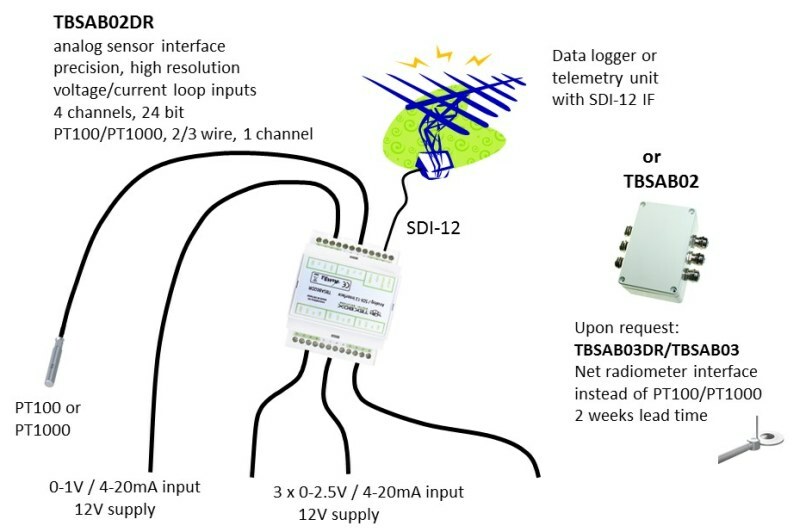 The TBSAB02 provides digital signals for the power management of the connected sensors. Four on board, SDI-12 controlled high side FET- switches are provided to power on/off connected sensors.